Orange Sceptre is an ever blooming butterfly bush in our zone. There have been only a couple of days all year where we have not had flowers. Orange Sceptre Butterfly Bush is a drought tolerant butterfly and hummingbird wonder. 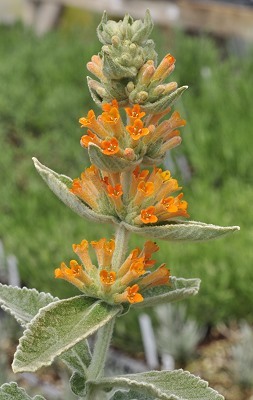 The soft, felty leaves are more green than gray but have that Lamb's Ear look and feel to them. Reported to get six feet tall, after two years ours is about four. We do have really severe summers though and that may slow the growth a bit. The picture of the Orange Sceptre bush at the bottom shows how much taller it is than Evil Ways Butterfly Bush which is the bright green shrub in the right hand corner. 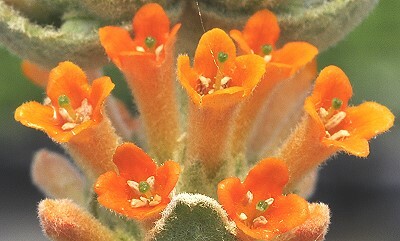 As you can see below the flowers are actually orange with a green stigma. What a beautiful flower! 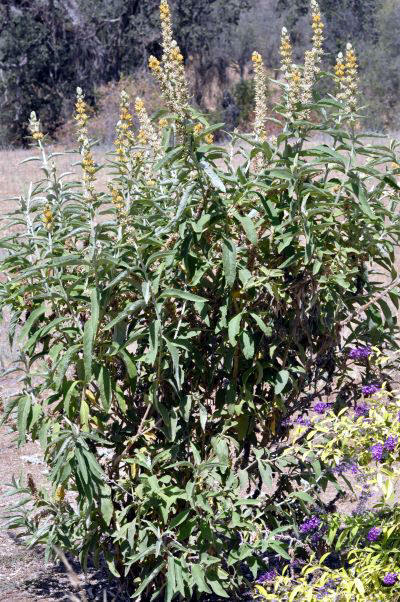 Orange Sceptre Butterfly Bush makes a great addition to our Wildlife Herb Garden Six Pack.